For some reason, round zucchini didn’t make it into my diet much back home. You don’t see them often in New York, or maybe I just wasn’t looking. As soon as I spotted them in Israel, though, I knew exactly what to do with them. Round zucchini, if you haven’t had them, are the ideal vehicles for stuffing of almost any kind. They’re easily hollowed out with a spoon, and – bonus – they look pretty. They make for neat little packages that are fun and elegant to serve to company or, well, any night of the week. I kept the courgettes (sorry – that’s me slipping into British English there) vegetarian and stuffed them with couscous, but anything you can dream up will work – ground meat, other vegetables, any number of grains – go nuts. Preheat the oven to 350F. Carefully cut the tops off each zucchini (I suggest cutting at a slight angle, as you would the top of a jack-o-lantern). Save the tops for the presentation. Using a spoon or melon baller, scoop out the inside of the zucchini, careful not to cut through the skin. Discard or save for another use. Bring a pot of water to a boil and steam the zucchini until just tender. Allow to dry, upside down, on paper towels. Meanwhile, cook the couscous according to your usual method. Heat the olive oil in a pan and add the tomato, onion, and garlic. Cook for 5 minutes. Add ¼ cup of the wine and simmer until sauce is slightly thickened, about 5 minutes. Mix the couscous with the tomato-onion mixture. Spoon the couscous mixture into each zucchini to the top. Put in a small baking pan (a loaf pan works well) and add the remaining ½ cup wine. Bake until wine is absorbed and zucchini is tender, about 30 minutes. Remove from the oven and allow to cool slightly. Put the tops of the round zucchini back on for presentation. I always see these around and never buy them. LOVE what you did with them. They look fabulous and that 2nd photo of them, BEAUTIFUL. Thank you thank you!! Yes, I finally bought them and love them! They taste like regular zucchini but are adorably shaped! These are so cute. 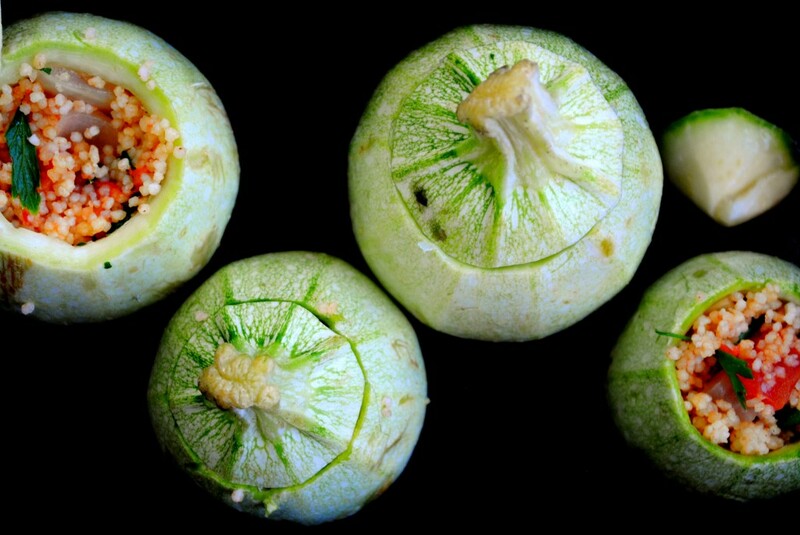 They remind me of turkish dolmas – yum! Thank you! They are totally in the same family as dolmas. But even easier to make! I love these! My favorite farmer, Big Ranch Farms here in Napa first introduced me to them as gem squash and later I discovered rond de nice. I have three in my fridge I’m planning on stuffing with pancetta and goat cheese. I’ll have to try your couscous recipe. It’s so clever. Oh lordie pancetta and goat cheese sounds just amazing! Brilliant. That is so cool! We only get the pale green ones here. Thanks! I hadn’t either! I just love how they look. They really are! Yum – all of your stuffings sound so good! May have to go out and buy some more! I can only imagine the flavor, and the texture when they are baked..love the stuffing, recipe and your pictures are sooo good! Thank you for sharing sweetie, and have a wonderful Monday! Awww thanks Sandra. You’re the sweetest. Have a great week!!! This is a wonderful combination of flavors and makes an excellent presentation. I will now be on the lookout for the round zucchini. Thanks for sharing this! Thanks Tina! They really are great. If you can find some definitely get them! This recipe looks amazing. I’m gonna try it but I have one question. Do you use 1/2 cup cooked couscous or 1/2 cup uncooked couscous which makes approximately 1,3 cup cooked couscous? Hi Mel, the recipe instructs to “cook the couscous according to your usual method.” So you will stuff the couscous with cooked couscous. Thanks so much for the note and I hope you enjoy! I just cooked it. I add fresh parsley and fresh basil too. It is so delicious. Thank you for sharing the recipe! Mel I am so happy to hear it!! I’m really glad you liked it. The parsley and basil sounds like a wonderful addition. Thanks for letting me know how it went! Love it! We tried stuffing the zucchini with small saffron cocciolette pasta and shrimps for a well-balanced low-fat dinner. It doesn’t just look great, it also tastes wonderful!